Some fourty poems illustrated by Gabriel Lefebvre, the illustrator of literature for youth. The artists are always touched by the poetry of Arthur Rimbaud (1854-1891), its strenght and its evocative power. Black and white or colour, whatever the images - painting, drawing or photography - they echo the poems. Gabriel Lefebvre is fascinated by this poet who remains today as a symbols of the early genius in literature. A lover of the East. 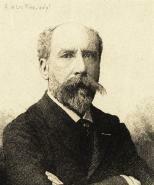 Georges Cazalis, known as Jean Lahor (1840-1909).